Easily Transform your Child’s Behaviour and Actions by Using the Secrets that Martial Art Schools have Been Using for Centuries! We can turn children’s lives around in as little as 30 Days. Give Family Martial Arts Centres – 30 Days and We Will Show You the Magic of The Martial Arts. GUARANTEED! Thank you for visiting our website. My name is John Parkinson. My school, Family Martial Arts Centres, has been successfully teaching valuable life skills and Martial Arts to children in the North West of England for over 20 years. Family Martial Arts Centres® programmes are vigorously designed in conjunction with experts in the field of education to provide social, physical and emotional growth. Along with my Instructors, we have established a goal to enhance the lives of children & adults so they will have the confidence to make the right choices in life. 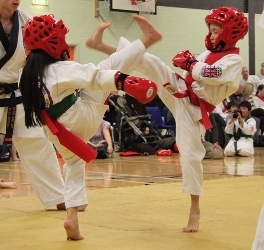 Family Martial Arts has enhanced the lives of many children, helping them to UNLOCK THEIR FULL POTENTIAL. Through martial arts your child will learn to follow rules and have the discipline to follow through. Through martial arts your child will listen effectively and will “zero in” on the task at hand and be unaffected by distractions! All types of challenges will be tackled more skillfully; your child will be free to pursue the many opportunities life has to offer, without fear! Your children will learn the skills it takes to stand-up to that bully. Your children will learn the valuable skills of stranger danger. We take them off the couch and teach them the importance of regular exercise. We give your children the tools to protect themselves against a bully. This training system involves instruction that teaches the basic fundamentals of self-defence along with building personal development in such areas as: integrity, self-control, confidence, perseverance, respect, loyalty and self-esteem. All classes are taught using the most safe, fun and exciting instruction methods available for this age group. Your child will actively participate to obtain his/her goals. This is a great way for kids to get exercise and have fun! Our special badge system is used for outstanding performance in martial arts class, home and school. The Karate for Kids system is based on a lifetime learning concept in addition to technical skills. Our basic building blocks for the Karate for Kids system are monthly themes, including the following: Courtesy, Respect, Confidence, Honesty, Perseverance, Self-Discipline. Parents, our martial arts school teaches the same values that you teach at home. To start your children on the journey to having unstoppable confidence simply bring your child along for a Free week of taster classes.